CRDB Tanzania has selected NETinfo’s Digital Banking Platform for implementing its Digital Banking Transformation Strategy. 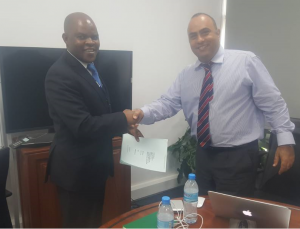 NETinfo Plc is proud to announce that CRDB Bank (Tanzania) has selected the NETteller Digital Banking Platform for realising its Digital Banking Transformation Strategy. ‘The Bank that listens’, as part of its business strategy and vision, is aiming at leveraging the capabilities of the NETteller Platform to offer to its customers a rich set of Retail & Corporate Banking Services and a seamless Customer Experience across all digital channels. CRDB aimed at employing a modern and powerful Omnichannel solution for offering to its retail and corporate customers rich functionality, a unique digital banking experience, a 360-view of their relationship with the Bank and full control of their financial performance & activity. This was achieved as NETteller provides powerful PFM (Personal Financial Management), personalisation management and cash management tools that enhance digital banking experience to the maximum, while bridging the digital and physical channels of the Bank. NETinfo Plc is an innovative Technology company, headquartered in Nicosia, Cyprus, that has been enabling Digital Transformation strategies for Banks and other Financial Institutions since 2001. NETinfo’s flagship products, NETteller Digital Banking Platform and NETteller Mobile Financial Solution, are successfully serving more than 38 Financial Institutions in 30 countries globally. NETinfo solutions successfully position banks in a new realm to become the banks of the future. They provide seamless Customer Experience and functionality covering Retail/Corporate Banking, Wealth Management and Insurance. NETteller has been allocated in the top global leaders in the Omnichannel industry by industry analysts. CRDB Bank Plc is an African bank and a leading Financial Services Provider in Tanzania with current presence in Tanzania and Burundi, East Africa. The Bank was established in 1996 and was listed on the Dar Es Salaam Stock exchange (DSE) in June 2009. Over the years, CRDB Bank has grown to become the most innovative and preferred financial services partner in the region. Supported by a robust portfolio and uniquely tailored products, CRDB Bank remains the most responsive bank in the region. CRDB Bank offers a comprehensive range of Corporate, Retail, Business, Treasury, Premier, and wholesale microfinance services through a network of over 120 branches, over 400 ATMs, 15 Depository ATMs, over 13 Mobile branches and 984 Point of Sales (POS) terminals.